Welcome to the “Characters” page for Police Precinct! This is the newest thing going with regard to Characters for Police Precinct, CHECK IT OUT! James is the SWAT Commander. James is the first character in Police Precinct that ties in with a Real-Cop! The real officer in this case is Bart Brunscheen, AKA “The Chief” from Dice Tower, who is a veteran with cred in the tabletop industry and on the Street! George Patsouras created the art for James based on a photo of Bart. Captain Odell comes from a family with a long history in law enforcement dating back to the 1800s out of Boston. 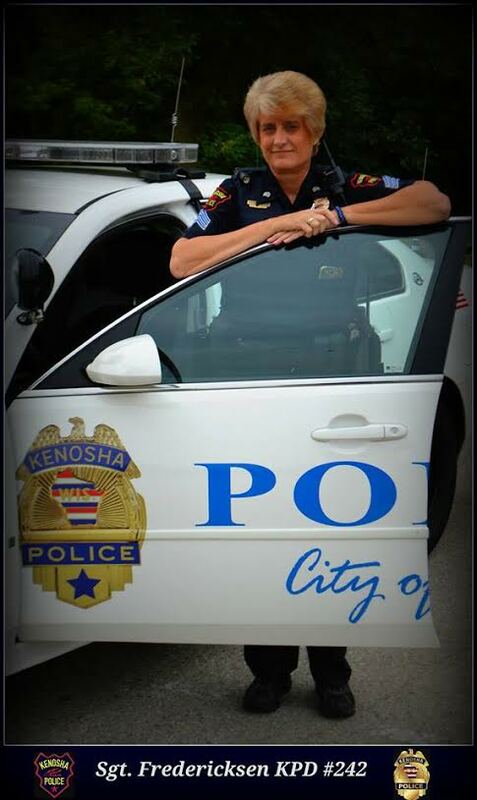 It hasn’t been easy, but Lieutenant Sears has risen up and led the way for other women in the CPD. Stan is a tough street-smart Sergeant who has developed a reputation for non-traditional approaches that get results. Uses a careful methodical approach, with a mix of her own well refined instincts to track down and apprehend the perps. Cool under any circumstance, and has the best network of CIs in the department. Ask Mike, if you want to know what “the-word-on-the-street” is. An aficionado of crime history knowledge. Joe uses the tried-and-true techniques of the great detectives of the past and mixes it with cutting edge technology to solve even the toughest cases. This card is upgradable (unlike the others), and if you want to play the Joe Kinney Character, you need to start on the Zuhra side of the card and upgrade to Joe. Like no one else, Doug can arrive at a crime scene and deduce exactly what happened and how. He also rubs elbows with others within law enforcement, which has helped CPD many times to access the resources of larger state and federal agencies. All of the new characters that came out with the 2nd Edition were part of a group called “The Cousins”. They are called this because they actually ARE cousins of the original characters. Each of the cousins can be found on the back-side of the corresponding original character. They are all of the opposite gender, which allows us to enter a new era of perfect balance within the department. If you want to see how the thinking grew and developed with regard to The Cousins, go Here! Then go here to see how it was finalized! 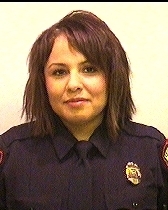 Yes, Cindy is a Real-Cop, and an amazing one at that! She rose to a very high rank and likes using unusual and unexpected techniques to solve crimes. Her favorite is social media! Another of the Real-Cops in Police Precinct, Horace has knows very well how to use his training and associations with air units, armored vehicles, and other special ops. A very Real-Cop! Younger cousin to Frank, Gloria continues the family legacy with her no-nonsense approach to getting the job done! To see this Real-Cop on a billboard, GO HERE! The real Pablo is a K9 expert. 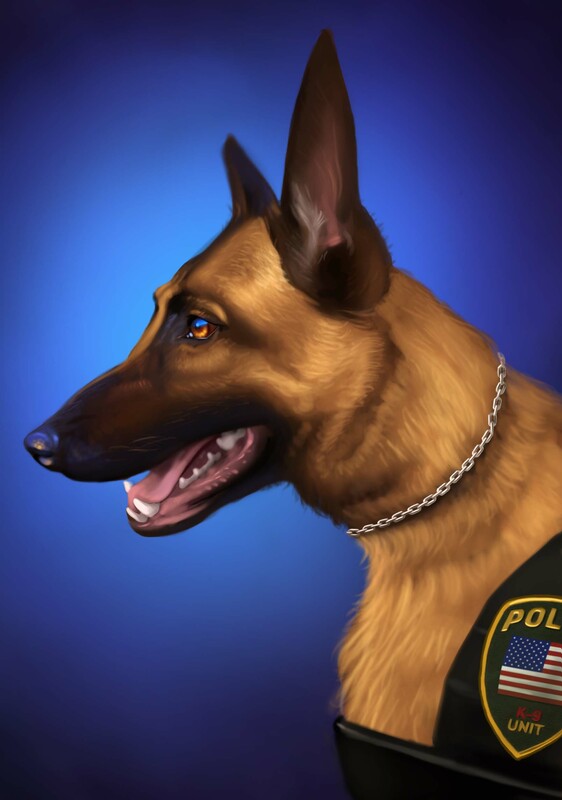 Since we have not yet released our K9 Character within the world of Police Precinct, the Pablo Character has other amazing talents in the game! We here at CMG at considering several possible paths for weaving character background stories into the game. Regina (and the others listed below) are at the top of the list for this. The biggest question with regard to this is “how?” One approach we are considering is to utilize the story telling abilities of our amazing Police Liaison Cindy Nowak, who has indicated an interest in this project in the past. Another option is to hold a writing contest among the fans of the game. We have had success with this sort of thing in the past. This means that maybe YOU will be filling in these stories, so start thinking now and, stay tuned!!! It is worth noting that Zuhra (and Joe) constitute the only (for now) Character Card that is upgradeable, though we plan to release others in the future. If you play with this card, please start on the Zuhra side and upgrade later if you wish. Want to see them ALL? We’re proud and very excited to bring a Police Dog to the game! He’s part of a batch of expansionary characters released in 2016, so now YOU can fight crime with Cipher! This is similar to “Transfer” except that the opposite side of the tile is still the same exact character (name, image, etc), except the “New and Improved” version. 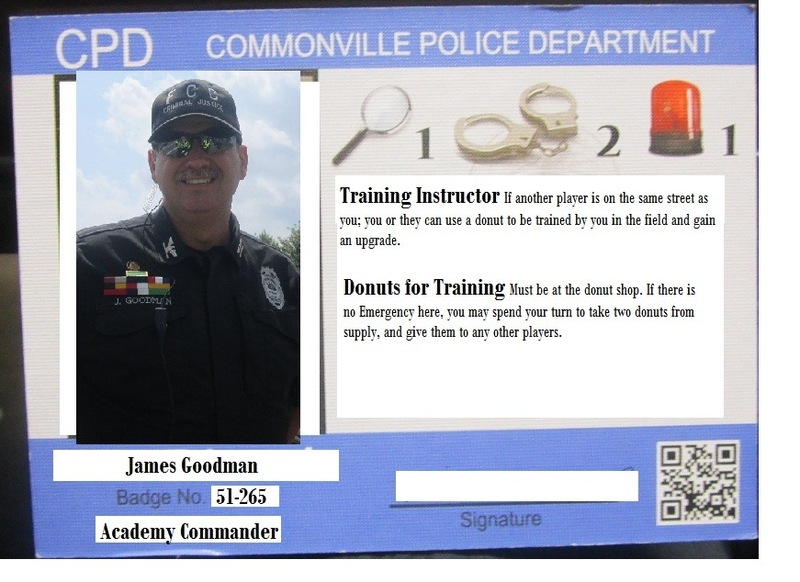 Wording: You can choose to apply for special training (night school) for the cost of one Donut + one Police Card. This allows you to flip your Character Tile, and is playable at any time / does not cost action. Another upgradable card: This is similar to “Night School” except more intensified and time consuming. The time needed to get this level of training is measured by Extra Events occurring (while you are in training), and to be accepted into the elite program you must have some solid successes under your belt (have earned a Donut). The opposite side of the tile is still the same exact character (name, image, etc), except the “New and Improved” version. Wording: You can choose to apply for Boot Camp for the cost of one Donut + at the end of the turn you must flip TWO Events. This allows you to flip your Character Card, and is playable at any time / does not cost action. We envision side one of this tile being at a level 1 power with ALL of the areas (investigation, arresting, and emergencies), and only one special power = “Boot Camp”. The other side of the card would be exactly the same in all ways except that the (only) special power would be “Graduate”. Wording: You have now graduated from Boot Camp, immediately select 4 free upgrades to your power (but no more than two of any one type). Does not cost an action. We here at CMG have an open door policy with regard to just about anything. This includes involving the fan-base of the game in the development of new cool things like Characters. We love to have YOU involved, and we created just the place for you to do that, so don’t hesitate to join the discussions with YOUR ideas for possible new characters. 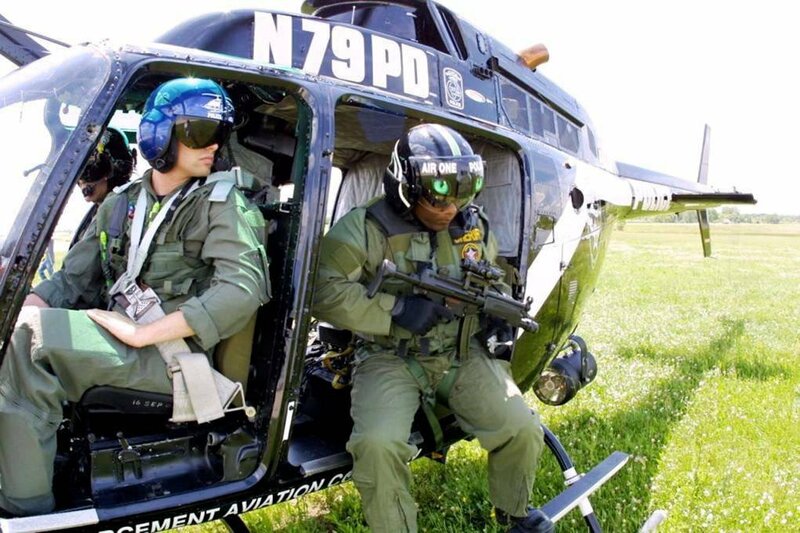 REAL COPS — Yes, we DO try to use REAL COPS to fight crime on the streets of Commonville. This all started with Bart Brunscheen who was the only REAL COP we used in the first batch of characters (out of 8 total = 12%). By the time The Cousins came along we had increased our percentage all the way up to 50%! The goal moving forward is to get ourselves to 100% and stay there… ALL REAL COPS!!! A lot of the credit for this goes to our Police Liaison Cindy Nowak. To learn more, Go Here! As we mentioned in the discussion above about The Cousins, we have now attained a perfect balance in the area of gender. There are exactly 8 women and 8 men characters in the game. We want to keep this balance, but how? Well, it shouldn’t be too hard, but certain characters will cause issues with this. An example is what about when we introduce a K9? Won’t this throw off the balance? It could, but not if we counter-balance that card with something gender-neutral on the other side, such as another type of police dog, or a robot/drone type character. The other option is to release even numbers of cards. So, a card with a male on one side and a male on the other can be balanced out with a female/female card. One way or another, we’ll figure it out, because we feel like keeping this balance is very important for the game. We feel this way because we want the game to mimic the type of balance that we want there to be in the Real-World. On a similar note, we are working to do the same thing with race/ethnicity, Go Here to see more about this, and to learn how we’re handling our Wait-List of Real Cops. On that note, are YOU a real cop? Want to be in the game!?! Students wishing to gain favor from their teacher traditionally might offer them an apple, but apparently in some cases — make them a character in a game! (We hope they all got an A). Thanks for visiting our Character page! Return to the BGG Character Discussion page!